Originally published under the title, "Diplomatic Malpractice." 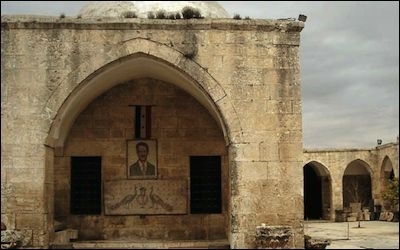 In 2006, while the Bush administration was struggling against Syrian proxies in Lebanon and Iraq, American taxpayer dollars funded the restoration of mosaics housed in this north Syrian mosque, displaying a poster of the late President Hafez Assad. The Ambassadors Fund for Cultural Preservation (AFCP) is a federal program that, since its establishment by Congress in 2001, has granted millions of dollars—$47,750,971 through 2013—to about 800 projects of foreign governments seeking to preserve historic structures and institutions. Administered by the Cultural Heritage Center at the State Department's Bureau of Educational and Cultural Affairs, AFCP is little known to the American public. Grants are made on the basis of recommendations by U.S. ambassadors for purposes including "the restoration of ancient and historic buildings, assessment and conservation of rare manuscripts and museum collections, preservation and protection of important archaeological sites, and the documentation of vanishing traditional craft techniques and indigenous languages." Through the Bureau of Educational and Cultural Affairs, the fund has issued public reports on its awards since 2001. Dismayingly, they show that AFCP has given money to two states classified as funders of terrorism by the State Department: Syria under the dictatorship of Bashar al-Assad and Sudan under the tyranny of Omar al-Bashir. In 2005-06, Syria was paid $20,300 by AFCP for restoration of St. George's Christian Church in the town of Izra', dating from the 6th century. For 2007-08, AFCP allocated $31,529 intended to encourage interpretation of "Busra's complicated Roman, Christian, and Islamic history to a multicultural audience." Syria received more AFCP money in 2006-07: $26,813 for restoration of mosaics in its northern "forgotten cities." The AFCP report for 2006-07 includes a photograph of the forgotten cities with a wall decorated by a poster of dictator Hafez al-Assad, who died in 2000. For 2007-08, the AFCP allocated $31,529 for "preservation and management" of the archaeological remnants of the city of Busra, in southern Syria, near the border with Jordan. The funds were intended, according to the report, to encourage interpretation of "Busra's complicated Roman, Christian, and Islamic history to a multicultural audience . . . [with] multilingual signage to improve the visitor experience in this culturally rich yet otherwise underdeveloped area of Syria and to enable tourism planners to incorporate this World Heritage Site into regional tour packages." Syria was granted more money by AFCP in 2008-09: $63,078 for conservation of pre-Islamic artifacts and for another Christian church, the Chapel of St. Hanania in Damascus, in two grants. Throughout this period, Syria was sponsoring terrorism. A State Department Bureau of Near Eastern Affairs Fact Sheet dated March 20, 2014, states: "Syria has been on the U.S. list of state sponsors of terrorism since the list's inception in 1979. Because of its continuing support and safe haven for terrorist organizations, Syria is subject to legislatively mandated penalties, including export sanctions under the Syrian Accountability Act and ineligibility to receive most forms of U.S. aid." With Syria ineligible for "most forms of U.S. aid," why was an exception made for historic preservation? Syria under Assad is sharply at variance with American political principles. Its policy of ostentatiously protecting Christian sites is a dishonest one, aimed at persuading religious minorities to support Assad against the Sunni Muslim majority. Exceptions to U.S. sanctions have long been established for family-related and cultural visits to Iran and Cuba. But neither of those countries qualifies for AFCP support. U.S. funding helped pay for a 2013 initiative to preserve Syrian artifacts. Furthermore, since the spring of 2011, Syria has been embroiled in unrest or full-scale civil war, a situation not conducive to the development of tourism. In September 2013, the State Department was finally compelled to recognize this. 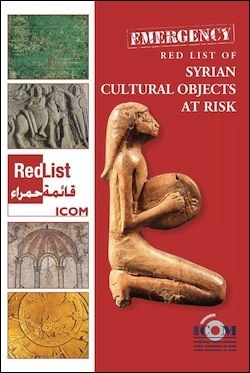 According to department spokesperson Jen Psaki, U.S. authorities cooperated with international museum experts to launch an "Emergency Red List of Syrian Cultural Objects of Risk." The list consists almost exclusively of movable artifacts such as inscriptions, manuscripts, books, vessels, seals, and similar items that could be looted and sold. It is a feature of a U.S.-endorsed "Syria Cultural Heritage Initiative," for which no U.S. financing has been disclosed. In Geneva, however, on December 22, 2014, the United Nations Institute for Training and Research, together with the U.N. Operational Satellite Applications Program, issued a report on "Satellite-Based Damage Assessment to Cultural Heritage Sites in Syria." The U.N. body determined that in the Syrian city of Aleppo, after extended combat between Assad forces and rebels in mid-2012, the highest rate of cultural destruction had been observed. Damage was inflicted at 135 locations, 22 of which were deemed destroyed and the rest described as possibly, moderately, or severely damaged. The world body identified Aleppo as "one of the (if not the) oldest continuously occupied cities in the world with some 7,000 years of known settlement history." Of Syrian sites for which AFCP designated grants in the past, according to the U.N., the northern forgotten cities have undergone an indeterminate level of destruction. The U.N. report states: "These Dead Cities have become home to thousands of refugees who have fled from the civil war and now live in the caves beneath the ruins. . . . Some have even dug up the ancient stone graves and are using them as makeshift homes. . . . There is little or no access to places like this while war rages, so the true nature of the devastation will not be known for some time. . . . In some cases, particularly where a Dead City has been resettled, there is the potential for looting." In Busra, the legacy of history has been diminished. The U.N. notes that Busra "survived about 2,500 years inhabited and almost intact," but recent "shelling damage appears to be concentrated in the area of the historic residences, some of which are still occupied today." The U.S. government's expenditures to advance Syrian tourism totaled almost $200,000 over a decade, despite what is known about the nature of the beneficiaries. For the grants made by AFCP to Syrian cultural professionals over the past 13 years to prove a useful investment, those curators and preservationists—if they are alive—will need to be assigned to the damaged sites. But first Assad must leave power and his Iranian and Hezbollah cohorts and the diverse gangs of jihadists acting allegedly in defense of Sunni Muslims will have to leave the country. The U.S. government's expenditures to advance Syrian tourism—almost $200,000 over a decade—may seem trivial. But they are indicative of a capricious policy pursued despite what is known about the nature of the beneficiaries. Thus, in 2008-09, Sudan, though listed as a terror-funder, and long after it had become a global pariah for its massacres in Darfur and South Sudan, received an AFCP grant of $33,455 for restoration of the Old Dongola Mosque in the north of the country. The fund report noted insouciantly that the mosque was constructed beginning in the 9th century as a Christian church—as if Sudan, a rogue, Islamist state that oppresses Christians, were being rewarded for that feature of its cultural profile. According to the report for 2011-12, AFCP has spent money in "120 developing countries around the world." Countries eligible to apply for AFCP assistance stood at 136 in 2011. The report states that "the Cultural Heritage Center uses the U.N. Human Development Index as a guide for determining eligibility." The countries qualifying for AFCP money include some that are not "developing," and are not so defined by the U.N. Human Development Index. These comprise Saudi Arabia, with "very high human development," and Russia, China, and Turkey, with "high human development." The Saudi kingdom has not asked for AFCP assistance, but Russia, China, and Turkey have done so successfully. In Russia, however, the Gulag museum at the former Perm-36 labor camp, which was given $28,060 by AFCP in 2005-06, was recently closed, its future unclear (see "Putin and the Perm-36 Gulag Monument," WeeklyStandard.com, August 26, 2014). In addition, AFCP money has been granted in the West Bank although neither Israel nor the Palestinian Authority is listed as eligible. In 2009-10, a grant of $55,700 is listed for cultural heritage protection in three unnamed Christian and Muslim villages in the West Bank. In 2010-11, AFCP provided $80,550 for conservation efforts at Jericho, in the eastern West Bank. Who received these grants—Israel, which controls the West Bank, or the Palestinian Authority, which administers it? Neither of the relevant AFCP reports names the recipients. AFCP, with its benign goals and relativist approach to regimes like those in Syria and Sudan, operates in Africa, the Americas, South and Central Asia, East Asia and the Pacific, Europe and Eurasia, and the Middle East. A considerable amount of AFCP money is given for preservation of religious structures—premodern, Hindu, Buddhist, and animist as well as Christian, Jewish, and Muslim. The AFCP budget also supports cultural restoration in several Muslim countries where the grants seem obviously linked to U.S. foreign policy and military aims. These include Afghanistan, Iraq, and Pakistan. In Afghanistan, AFCP money has gone almost entirely to mosques and fortifications. In 2001-13, Afghanistan received eight grants, totaling $1,818,110. These were awarded for a shrine to the Muslim ruler Babur, the Mullah Mahmud Mosque, and the Goldasta Mosque in Kabul, plus the Khoja Rokhband mosque complex, the Herat Citadel, and the Shahzada Abdullah shrine in Herat. More went to the Noh Gonbad Mosque in Balkh, in the north. Neighboring Pakistan, bloodied by terrorism, received $1,187,862 from AFCP in 2001-13. Grants were allotted for the Mahabat Khan Mosque in Peshawar, plus an Indian Muslim official residence, the Man Singh Haveli at Rohtas Fort, and the Sakhi Sarwar shrine in Punjab. In addition, AFCP distributed financial support for the Wazir Khan mosque and bazaar, the Sunehri or Golden Mosque and the Sheikhupura Fort in Lahore, the JalaludDin Bukhari shrine at Uch Sharif, and two Sufi shrines, one dedicated to Shams Tabraiz in Multan and the other to Muhammad Hayrat in Gujrat. AFCP grants apparently have contributed little to the stability of Afghanistan or Pakistan. U.S. funding for Sufi facilities may have been motivated by a belief that metaphysical Muslims will serve as reliable allies for the West against radical Islam, but this expectation is flawed. Some Sufis (including in Iraq) are jihadist while some are pro-Iranian, but most Sufis avoid backing states beyond what is necessary to protect their property from fundamentalist usurpation in Muslim countries, like Pakistan, and those with large Muslim minorities, like India. AFCP spending in Iraq has focused on preservation of pre-Islamic Babylon, with additional activities at the Iraq Museum in Baghdad as well as in Iraqi Kurdistan. Other Muslim-majority countries receiving AFCP assistance include several that are dictatorships, including the Central Asian ex-Communist states of Kazakhstan, Tajikistan, Turkmenistan, and Uzbekistan, and the African countries of Algeria, Burkina Faso, and Djibouti, along with Mali, which became a dictatorship in 2012. Tunisia received generous AFCP grants in 2003-04 and 2004-05, when it was still ruled by the despotic Zine Abedine Ben Ali, overthrown in 2011. Yemen was awarded AFCP money in 2011-12, under military autocrat Ali Abdullah Saleh, who fell in 2012. A new Congress is now seated, and the time may have come to open AFCP's books for review. What is the point of this U.S. largesse? Although it began in 2001, it was not a response to the atrocities of September 11; the first grants were announced by Secretary of State Colin Powell on June 27. Is it merely another fruitless exercise in "soft power" by the innovative functionaries at the State Department? When Hafez al-Assad died in 2000 and Bashar al-Assad replaced him, there was considerable hope that the Syrian regime would moderate its repressive and terroristic characteristics. Perhaps the AFCP grants to Syria reflected a belief that subtle incentives would bring change to such dictatorships. But Bashar al-Assad and many others have proved such hopes wrong. Since it began in 2001, AFCP has operated without significant public scrutiny. A new Congress is now seated, and the time may have come to open AFCP's books for review. If not, AFCP may soon be handing U.S. taxpayer dollars to Cuba for the refurbishment of its cultural legacy, ruined by the Communist era. And with Syria benefiting, why not Iran? Stephen Schwartz, a fellow at the Middle East Forum, is executive director of the Center for Islamic Pluralism in Washington, DC. Research for this article was supported by the Middle East Forum Educational Fund.